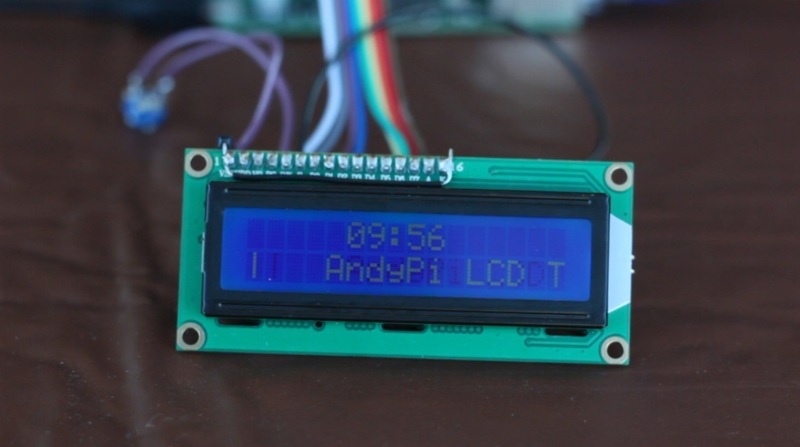 You can output pretty much anything you want to AndyPi’s LCD. It is controlled using Python, making use of the wiringpi and RPi.GPIO libraries, but you can also use C. Step-by-step instructions below show you how to display your IP address and a scrolling message from the BBC news RSS feed. You could also output something like a twitter feed or anything else you have in mind. For more information on how to program with python, do a google search, check out the Raspberry Pi forum, and look at the relevant section of the Raspberry Pi Educational Manual for a start. Follow the instructions on this page. This gives assembly instructions for the kit version (no soldering required if you have AndyPi’s Plug & Go version), and details of how to wire the LCD to the Raspberry Pi GPIO ports. 5. This class contains the following functions which you can call from another script – see the examples in part C & D below. If you want to clear the display, you’ll have to write a new python script and call the lcd.cls() function! This script downloads the BBC world news RSS feed, and scrolls it across the display, with the time displayed on line 1. Every 30 seconds, the script checks for new news. This script is continuously running, so to stop it and clear the display, press CTRL-C.
Of course, you can substitute your own message – perhaps your latest tweets, or output of something else from your Raspberry Pi. Note: The video shows a combination of the scripts in Part C and D, to output the current news feed (but doesn’t check every 30 seconds) and your IP address.